The Chinese and Japanese leaders have shaken hands and spoken to each other in an unexpected meeting on the sidelines of the G20 summit. China's Xi Jinping and Japan's Shinzo Abe have not met since they took power in March 2013 and December 2012 respectively. Ties between the two sides have been severely strained by a territorial dispute. Both sides claim islands in the East China Sea. The islands, known as Senkaku in Japan and Diaoyu in China, are controlled by Japan. But China was angered last year when the Japanese government bought three of the islands from their private Japanese owner. 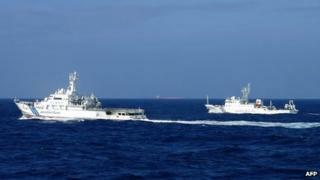 Since then, Chinese government vessels have been sailing in and out of what Japan says are its territorial waters around the islands, prompting fears of an accidental clash or escalation. The two leaders met for between four and five minutes just before the main G20 leaders' session began at the summit in St Petersburg on Thursday, Japanese officials said. Mr Abe told Mr Xi "about our thoughts that we should develop Japan-China relations by going back to the original point of the strategic, mutually beneficial relationship", Japan's top government spokesman Yoshihide Suga said. According to state-run Xinhua news agency, Mr Xi said China-Japan ties were "facing grave difficulties" which "we are unwilling to see". China favoured mutual beneficial ties, Xinhua quoted Mr Xi as saying, but Japan had to address the territorial row and historical issues "in line with the spirit of facing history squarely and looking forward to the future". China accuses Japan of failing to address adequately issues related to its war-time conduct. Video Will China's warships trigger arms race with Japan?